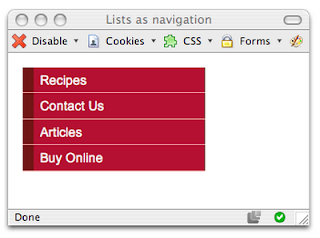 Good Web Navigation. When creating a site, we have to think that we are someone who came into the site that we create. Of course we will be thinking about the ease way of searching for information in a site. As a webmaster of the most important thing is the easy and clear navigation to reach important points about the content of a page that may be search by visitors. A first time visitor on your web page so that the foreign feel of a navigation aid in form of clear instructions and the right target. So the good navigation is important to make your visitor page enjoy the time to surf in your site. Navigation is the links that use right anchor text so the visitor can understand the meaning of what the link that he is heading. Many examples can be provided to facilitate the visitors who want to surf on our web page. Suppose we have a web-based in e-commerce, of course the page required information about the products we offer, how to buy item and delivery procedure. If our web-based is information, tips and tutorial, we need to make some categories to make it easier for visitors to find what he needs. As an example we must show a clear categories so that visitors not do some mistake, because when a visitor does not get that he was sure he would be looking to leave your page. To overcome this by using the archive can explain the contents of your web page. With the archive navigation will help visitors to find the page that may not be known by the visitor. For some facilities there is a web platform that can display a random post, the page that was issued in random. Search form is also important to search for pages related to keywords that are searched by visitors. For the web that contain information about the news and do not use ornament that is not useful, because other than the vain of course will make your page loading to become heavy. Some visitors will leave a web page if it is the page takes a long time for loading.